Life on earth, in all its diverse forms, is made possible and sustained by three key cycles. Ultimately powered by the sun, these cycles comprise sequences of events that recycle and rebalance the biosphere. These are the water cycle, the nitrogen cycle and the carbon cycle. Carbon is an abundant element which exists in many different forms, and can be organic or inorganic in origin. Carbon-based molecules are the basic building blocks of plants and animals. As well as this organic form, inorganic carbon is a major component of many minerals, and a constituent of our atmosphere in gaseous forms, such as carbon dioxide. As well as the carbon actively involved in the cycle of life, forming the bodies of living plants and animals, there are also reservoirs or sinks, where fossil carbon compounds are locked away. 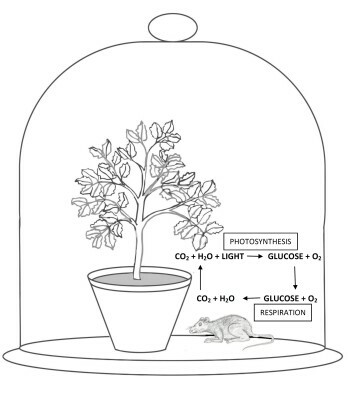 The basic mechanism of the carbon cycle is that plants and organisms use energy from the sun to break carbon dioxide gas from the atmosphere into carbon and oxygen. The carbon is used to build the plants’ structure and oxygen is released to the atmosphere as a waste product. When the plant or organism dies, the carbon remains locked in fossil form. This process has been on-going since life first appeared on earth. 3.6 billion years ago. Over that period, the effects of biological life on the earth’s atmosphere have changed it incrementally from a toxic mix of carbon dioxide, methane, ammonia and water vapour to an atmosphere that can support complex plants and animals. In the 19th, 20th and 21st centuries, Man’s activities are affecting the balance of carbon on our planet, with potentially catastrophic results. This is largely through the burning of fossil fuels. Fossil fuels, be they coal, gas or oil, are the fossilised remains of plants and animals that lived millions of years ago. When they were alive, they absorbed the sun’s energy to split carbon from oxygen. When their remains are burned, the reaction is reversed. The carbon re-combines with oxygen to form carbon dioxide and the concentrated heat energy of the sun absorbed millions of years ago is released. Methane and nitrous oxide are also generated. It is sobering to consider that the fossil fuel we burn each year took life on earth over 3 million years to produce. Effectively, for each year we burn fossil fuels at the current rate, we wind the earth’s atmosphere back by 3 million years. Carbon dioxide levels in the earth’s atmosphere do, and always have, fluctuated naturally, as a result of volcanic activity for example. However, most scientists now agree that the steep rise in global carbon dioxide levels since the Industrial Revolution is a direct result of Man’s activities. As well burning fossil fuel, Man has also been recklessly damaging the natural world. Forests absorb huge quantities of carbon dioxide, locking in atmospheric carbon and releasing oxygen. Forests could be seen as the lungs of the world. Continuing rapid deforestation on an industrial scale reduces the biosphere’s ability to balance and regulate global carbon dioxide levels. The major significance of high carbon dioxide levels, currently around 380 parts per million is that carbon dioxide is a greenhouse gas. It has been known for over a century that carbon dioxide absorbs infra-red radiation, i.e. heat. As carbon dioxide levels in the atmosphere rise, less solar radiation is lost to space and the world heats up. This is global warming. Although there is a debate about the probable consequences of global warming, there is now a consensus of opinion that it is occurring. Together with food, shelter and social order, energy is a pre-requisite for human civilisation. It is clear that Mankind now faces an energy challenge. Not only are fossil fuel reserves finite, but we are now aware of the negative consequences of their untrammelled use. The god news is that solutions do exist. As a species, we need to be less profligate in our energy use. The emphasis need to be on energy efficiency and the development of energy efficient technology. Sustainable practices can be adopted to manage and protect the global environment and bio-diversity. Fisheries, forestry and farming need to be placed on a sustainable footing. In addition, renewable energy technologies need to be further developed and widely adopted to replace reliance on fossil fuels.